DatabaseUSA.com® offers the most accurate consumer mailing lists available. Our Consumer lists were created to provide a range of information that is easily customizable to your marketing needs. With over 245 Million Consumers, this valuable file allows you to refine your leads by choosing from hundreds of different selection criteria. We can help you refine your search criteria to fit your target market and ideal consumer. DatabaseUSA.com® offers over 150 Million U.S. Homeowners. 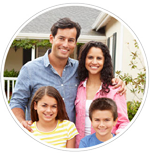 Home Value: Target your audience with home value selections. The value of a prospect’s home is an excellent predictor of their ability to buy. Length of Residence: The longer someone’s lived in a house, the more they will spend on remodeling, repair, maintenance, new furniture, lawn care, landscaping and much more. Also, length of residence is a good indicator of economic stability. Age and Gender: Age and gender of homeowners can be used for targeting the right message to the right prospects, helping to create just the right homeowners mailing list. Household Size: The number of people in a household can be used for targeting the right message to the right prospect. Presence of Children: There are a lot of expenses associated with raising a child, money that simply has to be spent. From diapers to degrees, toddler toys to computer games, toy drums to violin lessons, homeowners with children are ready to give their kids the things they need to succeed. Complete the form or call us at 877.407.0101 for more information about our Consumer & Homeowner Database.